Well, don’t get too excited by the title. Of course there were no live dinosaurs at the Memphis zoo, since dinosaurs are extinct. But the zoo does have an incredible collection of life-sized dinosaur figures that move, make noise, and even look like they are breathing. One of the most interesting parts of the dinosaur exhibit is the Tyrannosaurus rex. Before you enter the exhibit, a warning is posted that some of the material might be quite graphic. That is certainly true of the T-rex. The huge carnosaur (meat-eating dinosaur) is shown eating a wounded Triceratops. 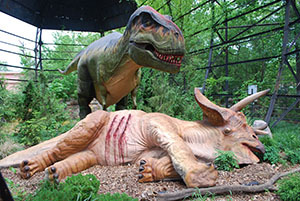 The T-rex moves its head up and down, while the wounded Triceratops breathes heavily and struggles to live. There are lots of other interesting dinosaurs as well. A huge Giganotosaurus looms over the fence as children walk near its head. A baby Stegosaurus about the size of a small car “walks” among the plants. A huge-headed Styracosaurus seems to be looking for tasty vegetation to eat. A playful looking Ankylosaurus stares past a wooden fence at passers by. 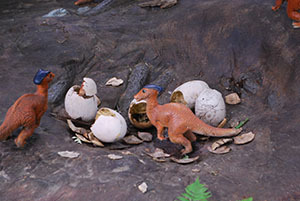 And several newly hatched Parasaurolophus babies are pictured scampering around in their nest. There is even a “dino dig” at the end of the exhibit where you can brush sand off of fossils like a “real” paleontologist. Even though the exhibit is great in many ways, it does present some false teaching. For instance, one information board explains that the dinosaurs evolved into birds. The plaque states that scientists “learned” this by studying a tiny shred of a protein from a T-rex. That simply is not true. While the T-rex protein may be similar to proteins found in birds, that does not prove dinosaurs are related to birds. In fact, there is no way dinosaurs could have evolved into birds. God created birds on day five of Creation. Land-living dinosaurs, such as the T-rex,were created on day six of Creation. Dinosaurs didn’t evolve into birds. Birds were here first. In addition to the false notion that dinosaurs evolved into birds, the exhibit also presents the idea that dinosaurs lived millions of years ago. That is not true either. The world has not been around for millions of years. Land-living dinosaurs and humans were created on the same day of Creation only a few thousand years ago. At least the people who wrote the information at the exhibit said that the signs “show the era in which many believe the dinosaurs walked the earth.” Just because many people believe dinosaurs lived millions of years ago does not make it true. There was one sign that I was thrilled to see. Near the end of the exhibit there is a board that has on it information about dinosaur extinction. 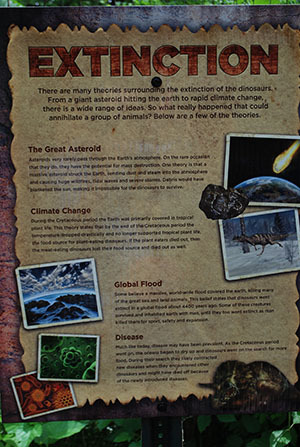 The board presents several theories about what happened to the dinosaurs. One of the ideas it presents is that a global Flood about 4,400 years ago killed most of the dinosaurs. The board states that some lived through the Flood (we would say on Noah’s Ark) and died off later. It was the first time I had ever seen the idea of the Flood presented so clearly at such a secular dinosaur exhibit. Of all the “theories,” the global Flood idea definitely fits the available evidence the best. As people who believe in God, Creation, and the Bible, we should not be worried about visiting exhibits about dinosaurs and other animals because evolution might be taught. We should simply educate ourselves with the truth, and prepare to learn all the truth that we can, but reject any error that is taught. As the apostle Paul said, we are to “test all things; hold fast what is good” (1 Thessalonians 5:21).